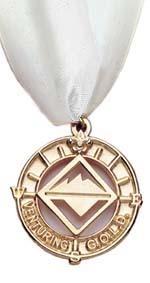 The Venturing Gold Award program is designed to permit adaptation of certain phases of the program so that all Venturers may work for and achieve the award. The candidate must have at least 12 months' tenure as an active, registered Venturer before final qualification. An elected youth officer of a church or school organization. The candidate must have participated in a district, council, area, region, or national Venturing event. The candidate must, in consultation with the crew Advisor or a member of the crew committee, set and accomplish one personal growth goal related to each of the following areas: citizenship, leadership, service to others, community/family, outdoor experience, and total fitness (six personal growth goals). Complete a cardiopulmonary resuscitation (CPR) course or an Emergency Medical Technician (EMT) course. Plan and carry out a personal exercise program over a four-month period, i.e., jogging, running, swimming, weight reduction, or physical conditioning. Practice for, and attain, the Presidential Physical Fitness Award. Complete a reading program of the scriptures, classic literature, historical series, etc. Serve for six months as a reading counselor for a child with reading problems. Visit a nursing home, on a regular basis, over a four-month period, to help write letters or to read to patients or provide personalized services. Plan and, with the help of at least four other Venturers, carry out a conservation project that is approved by an agency of the federal, state, or local government, such as the National Park Service, the Department of the Interior, the Bureau of Land Management, state division of parks and recreation, city or county parks department, etc. Plan and chair a committee that stages a major social activity involving crew members and their parents, or crew members and their entire families. Plan and carry out a series of crew activities over a four- to six-month period, related to an interest of crew members. Professional or volunteer consultants could be asked to present information regarding their specialty, profession, or occupation. Help organize a new Venturing crew, or revitalize an inactive crew; coordinate activity with BSA local council staff members. Organize a recruitment drive to add members to your own crew or to other crews in the district/council. The drive should last at least one month, and the recruitment plan should include specific activities oriented toward recruiting new members, goals, methods of publicity, etc. The candidate must be able to recite the Venturing Oath. The candidate must submit three letters of recommendation to the crew Advisor that confirm he or she lives in accordance with the principles of the Venturing Oath. The letters should come from adults outside the crew, such as school or religious leaders, employers, or community leaders. After completing all other requirements, the candidate should prepare evidence of completion of the work and submit it to the crew Advisor. The crew president, in conjunction with the crew Advisor, should then appoint a review committee of four to six people including Venturers and adults. The committee should review the candidate's written presentation and interview the candidate to determine whether that person grew as a result of the pursuit of the Gold Award. Finally, the candidate must have qualified for the Gold Award before his or her 21st birthday. Because of the designed, flexible nature of the program, crew Advisors and crew committee members are permitted a reasonable degree of latitude in approving activities that serve to meet the qualifying requirements for the Gold Award in the areas of leadership, personal growth, and crew activity projects. Likewise, crew Advisors, crew committee members, and Venturers are encouraged to seek out additional appropriate activities, bearing in mind the purpose of the Gold Award program. NOTE: The Gold award is recognized nationally; however, the program is administered and approved, and recognition is made, at the local level.